WASHINGTON, D.C. -- About one in four U.S. parents (24%) say they fear for their children's safety when they are at school. Parental worry was last at that level in August 2012, a few months before it rose in response to the Sandy Hook Elementary School shooting in Newtown, Connecticut. After the Newtown tragedy, parents' concern increased, with 33% saying they were fearful for their child's safety, up from 25% in August 2012. Nearly a year after the attack, parents' level of worry had not decreased. Since then, fear eased slightly but had not reverted to pre-Newtown levels until now. 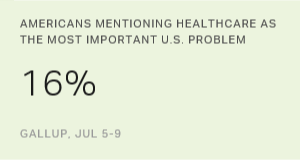 The current results are based on Gallup's annual Work and Education poll, conducted Aug. 2-6. The poll updated responses to a question Gallup first asked in 1977 about whether parents fear for their oldest child's physical safety when he or she is at school. Because the question is not specific beyond the words "physical safety," parents could be thinking of such things as bullying, physical violence between students, unsafe school conditions and, of course, school shootings. However, the percentage of parents expressing fear has usually surged after a mass shooting. The high point in parental concern of 55% came in a poll conducted April 21, the day after the 1999 Columbine High School shootings in Colorado. Worry remained elevated for months after Columbine, finally dropping below 40% in August 2000. In the ensuing years, parental fear levels have generally been lower, but they still spiked occasionally in polls conducted immediately after mass school shootings, including to 45% after attacks in Santee, California, in March 2001; to 35% after a shooting at an Amish schoolhouse in Pennsylvania in October 2006; and to 33% after Newtown. The historical low point in parental concern was 15% in 2008. The average since 1977 is 29%. Relatively few parents, 6%, report that any of their children have expressed concern or worry to them about feeling unsafe at school when they return this fall. That represents a new low in Gallup's trend, though it is statistically similar to four separate 8% readings over the past 17 years. Gallup first asked this question in 1999 in the months after Columbine and found 18% of parents saying their children had expressed worry about feeling unsafe. The high reading of 22% came in a poll conducted after the Santee, California, shooting. On average, 11% of parents have reported their children have voiced concern about their safety. U.S. parents' level of concern about their children's safety has finally receded to the level it was at before the Newtown massacre. Given the young ages of the victims in that incident, it appears to have left a lasting impression on parents. In the time since Newtown, many more public shootings have taken place in the United States, but most of these have occurred in settings other than schools, including an Orlando, Florida, night club; a San Bernardino, California, social services center; a Charleston, South Carolina, church; and a Fort Hood, Texas, military base. Also, schools have stepped up safety efforts in an attempt to prevent a mass shooting from occurring on their grounds. Both a lack of recent school shootings and greater safety measures could be helping to ease parents' concern. As has always been the case over the past two decades, more parents say they personally worry about their children being unsafe than say their children have shared feelings about being unsafe themselves. Of course, some of that difference could be explained by some concerned children not expressing their feelings to their parents. But it also suggests that parents worry more about their children's safety than their children do. Results for this Gallup poll are based on telephone interviews conducted Aug. 2-6, 2017, with a random sample of 233 parents of school-aged children living in all 50 U.S. states and the District of Columbia. For results based on the total sample of national adults, the margin of sampling error is ±8 percentage points at the 95% confidence level. All reported margins of sampling error include computed design effects for weighting. 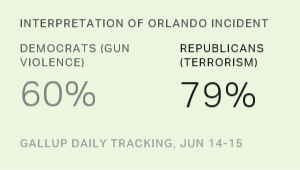 Most Republicans, 79%, interpret the recent mass shooting at an Orlando nightclub as an act of Islamic terrorism, while the majority of Democrats, 60%, perceive it as an act of domestic gun violence. Americans who have recently been the victim of a crime report higher rates of gun ownership than nonvictims.